AGCO ST30 Tractor W/AGCO SL44 Loader 2 Post ROPS, 869 Hours, 28 Hp Diesel Engine, 9 Speed Synchronized Transmission, 4x4, SL44 Loader, 60 Loader Bucket, 3 Point Hitch, 540 PTO, Drawbar, 12.4-16 Tires SERIAL#: JN20306 STOCK#: 124983 PLEASE CHECK THE ITEM DESCRIPTION AREA FOR ADDITIONAL PICTURES AND INFORMATION. AGCO ST30 Tractor W/AGCO SL44 Loader, 869 Hours! 4X4, 28 HP Diesel Engine, 3 Pt. AGCO ST30 Tractor W/AGCO SL44 Loader 2 Post ROPS, 869 Hours, 28 Hp Diesel Engine, 9 Speed Synchronized Transmission, 4x4, SL44 Loader, 60 Loader Bucket, 3 Point Hitch, 540 PTO, Drawbar, 12.4-16 Tires SERIAL#: JN20306 STOCK#: 124983. We also accept checks and cash. We will NOT release any equipment without proper documents! This policy protects you as well as us. Are never refundable because of a defective machine. You always have the option of coming to our location to check out the item in person and we strongly encourage this. All items can be picked up at our location by the purchaser or an authorized representative. We have several loaders and lifts on-site and a loading dock with several different heights. We require any person picking up an item, especially a third-party, to have appropriate documents / information when doing so. Please be sure to provide your driver with a paid invoice of the item(s) being picked up and a bill of lading (if applicable). Persons picking up any item(s) may be asked to show I. We do not disclose or share any personal information. This is an "AS-IS, where is" item. Look at all pictures closely, the pictures show the condition of the item in your opinion. We explain all equipment to the best of our abilities and we are more than willing to attempt to answer any questions you may have. Therefore, we cannot and do not guarantee the hours of service on any of the items we sell. We do guarantee that we never turn back hour meters or tachometers so the information we report for an item is taken directly from the specific meter. If a machine shows low hours or miles, etc. That do not appear to be correct, we will tell you that. Otherwise, our information is from the machine and accuracy is not guaranteed. All information we provide for items, such as serial numbers, weights, horsepower, lift capacities, year, etc. Is taken from sources generally deemed to be accurate. We do not guarantee that information but provide it for your assistance. We work hard to give our customers the best experience possible, and we love the chance to make things right for our customers if they are not. Our success depends on our customers like YOU, so please allow us the chance to keep you happy! Repeat customers are our goal! Some items may also be included in one of our monthly auctions. If you have any questions, any one of our sales staff members are happy to help you. If an item will not load onto a truck or your truck under its own power, we will either push it on or we will use the appropriate equipment to lift it onto the truck. You are then responsible for moving the item from our lot to your destination at your own expense, and the fact that it did not run is covered by the "as-is" designation. There may be more things wrong with this item than contained in the description, and they generally occur because they are hidden and cannot be seen when describing the item. McGrew Equipment Co is one of the largest used farm and construction dealers in the Northeastern United States. The company is in Seven Valleys, PA along Route 616, just south of York PA. It was established in 1999 by Gregory W. McGrew and has been growing larger every year. We now have a location in Great Mills, MD as well as New Egypt, NJ. You never know what you may find in our rapidly changing inventory of agricultural and industrial equipment ranging from late model, unused to antique. No matter how large our business grows, our customers will always come first. We would be happy to talk to you and answer your questions. Get Supersized Images & Free Image Hosting. Create your brand with Auctiva's. Attention Sellers - Get Templates Image Hosting, Scheduling at Auctiva. The item "AGCO ST30 Tractor WithAGCO SL44 Loader, 869 Hours! , 4X4, 28 HP Diesel Engine, 3 Pt" is in sale since Thursday, December 13, 2018. This item is in the category "Business & Industrial\Heavy Equipment, Parts & Attachments\Heavy Equipment\Tractors". 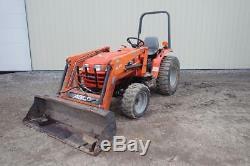 The seller is "mcgrewequipment" and is located in Seven Valleys, Pennsylvania.